Matt Letley will play his last show with the group on Wednesday at London's O2 Arena and said his decision to move on was not related to a series of reunion shows featuring past members. The group's classic original line-up will reform next year as stalwarts Francis Rossi and Rick Parfitt are rejoined by Alan Lancaster and John Coghlan. The quartet will play live together for the first time in three decades. Matt said: "It's been a fantastic journey over the past twelve years or so but I have decided that now is the right time for me to leave Quo and move on to something new. "No doubt there will be much conjecture that this is somehow related to the upcoming reunion gigs but I'd like to assure everyone that it has no bearing on my decision. "Indeed I wish the guys every success with this tour and certainly hope to come along to see one of the shows." 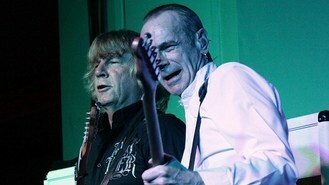 Quo manager Simon Porter said: "The band would like to thank Matt for a dozen years of loyal service. He's a true pro and it's been a pleasure to work with him." Francis, Rick, Alan and John were in the group when they adopted their name in 1967, and featured on their breakthrough top 10 hit Pictures Of Matchstick Men. The line-up was known as the "frantic four". Frontmen Rossi and Parfitt - who first teamed up 50 years ago - carried on under the name following the departure of the others in the 1980s.